March Break Theme Camp is now over. Thank you to everyone who attended and we hope to you in our Summer Camp! Every year, the Thunder Bay Museum offers themed full-day programming for children ages 6-12 during March Break. No two days are exactly alike; our in-house Education Coordinator plans a full range of activities including songs, dance, games, drama, storytelling, gallery tours, science experiments, scavenger hunts, and so much more. With all that variety, there’s sure to be something for everyone! Curious what a typical day of programming looks like? 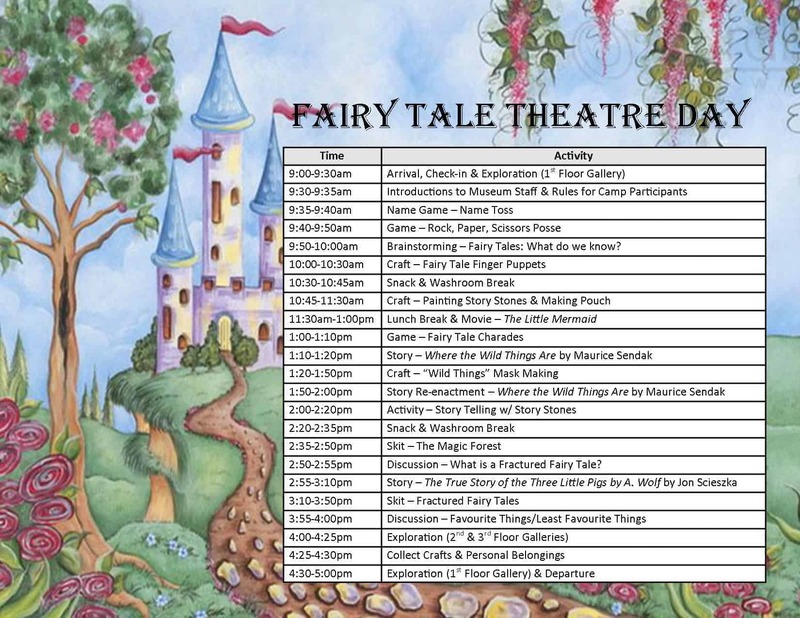 Take a peek at the itinerary for our “Fairy Tale Theatre Day”. Participants are only registered for a program once their payment is received. Please note that we do not keep a wait list, so register early to avoid disappointment. Click here to download Emergency Contact & Photo Release Forms. Please check with this website or contact our Education & Outreach Coordinator for more information about the 2018 March Break Theme Camps by email or by phone at (807) 623-0801.